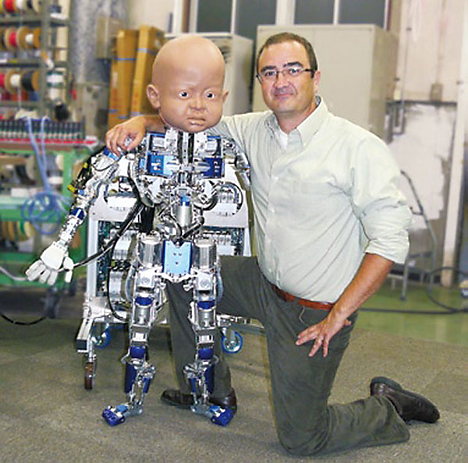 Different faces of Diego-san: video of robo-toddler shows him demonstrating different facial expressions, using 27 moving parts in the head alone. The world is getting a long-awaited first glimpse at a new humanoid robot in action mimicking the expressions of a one-year-old child. The robot will be used in studies on sensory-motor and social development – how babies “learn” to control their bodies and to interact with other people. Diego-san’s hardware was developed by leading robot manufacturers: the head by Hanson Robotics, and the body by Japan’s Kokoro Co. The project is led by University of California, San Diego full research scientist Javier Movellan. Movellan directs the Institute for Neural Computation’s Machine Perception Laboratory, based in the UCSD division of the California Institute for Telecommunications and Information Technology (Calit2). The Diego-san project is also a joint collaboration with the Early Play and Development Laboratory of professor Dan Messinger at the University of Miami, and with professor Emo Todorov’s Movement Control Laboratory at the University of Washington. Movellan and his colleagues are developing the software that allows Diego-san to learn to control his body and to learn to interact with people. “We’ve made good progress developing new algorithms for motor control, and they have been presented at robotics conferences, but generally on the motor-control side, we really appreciate the difficulties faced by the human brain when controlling the human body,” said Movellan, reporting even more progress on the social-interaction side. “We developed machine-learning methods to analyze face-to-face interaction between mothers and infants, to extract the underlying social controller used by infants, and to port it to Diego-san. We then analyzed the resulting interaction between Diego-san and adults.” Full details and results of that research are being submitted for publication in a top scientific journal. While photos and videos of the robot have been presented at scientific conferences in robotics and in infant development, the general public is getting a first peak at Diego-san’s expressive face in action. On January 6, David Hanson (of Hanson Robotics) posted a new video on YouTube at http://www.youtube.com/watch?feature=player_embedded&v=knRyDcnUc4U#!. Diego-san is the next step in the development of “emotionally relevant” robotics, building on Hanson’s previous work with the Machine Perception Lab, such as the emotionally responsive Albert Einstein head (see video on Calit2 YouTube channel). The video of the oversized android infant was picked up by the popular online technology magazine, Gizmag, with a Jan. 7 article titled “UCSD’s robot baby Diego-san appears on video for the first time,” written by Jason Falconer. For that reason, the robot’s sensors and actuators were built to approximate the levels of complexity of human infants, including actuators to replicate dynamics similar to those of human muscles. The technology should allow Diego-san to learn and autonomously develop sensory-motor and communicative skills typical of one-year-old infants. The researchers are interested in studying Diego-san’s interaction with the physical world via reaching, grasping, etc., and with the social world through pointing, smiling and other gestures or facial expressions. The project may also open new avenues to the computational study of infant development and potentially offer new clues for the understanding of developmental disorders such as autism and Williams syndrome. As noted in the Gizmag article, Diego-san won’t be the only child-like robot for long. 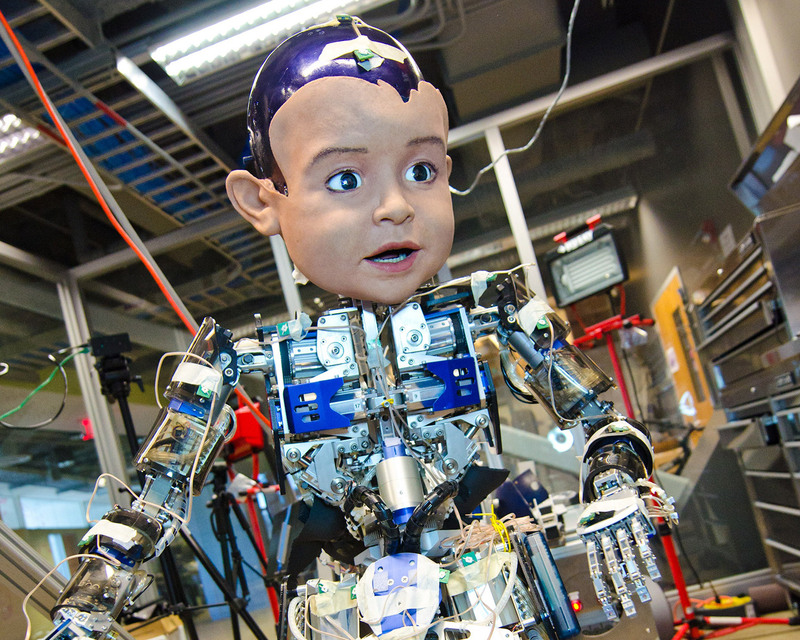 This spring Swiss researchers will demonstrate their nearly 4-foot-tall Roboy robot toddler (with a face selected via a Facebook contest! ).